If you’re thinking about selling a luxury home, please consider these 10 luxury home selling tips. Selling your luxury home is not like selling a traditional home. First off the buyer pool may be limited so you sellers need to create a marketing plan that will get you the most exposure possible. 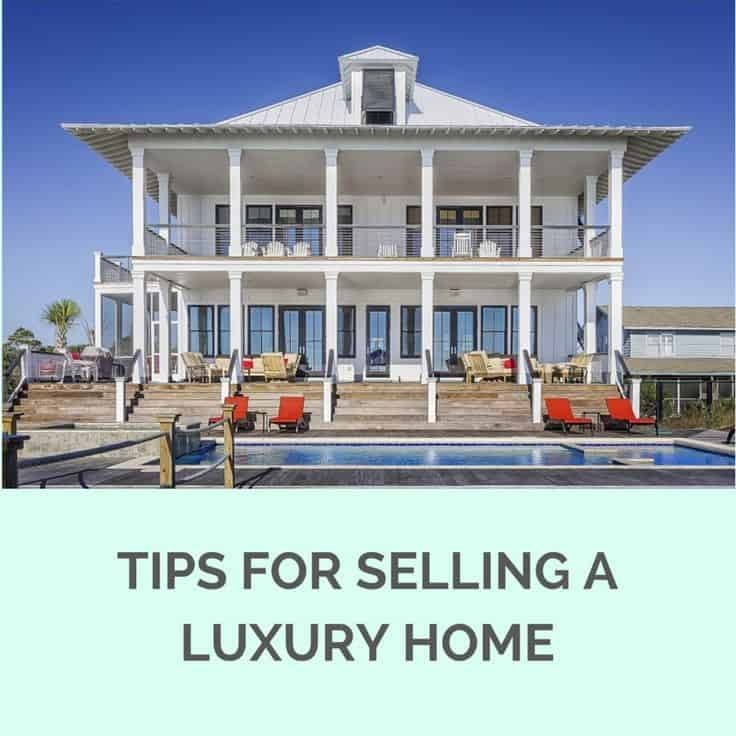 The following 10 luxury home selling tips on selling your luxury home will assist you in getting your luxury home sold fast and for top dollar. As a buyer you want the best deal, likewise as a seller you want to sell for top dollar. Remember when you bought the home you more than likely highlighted in your mind everything wrong with the home and it’s interesting that as a seller it’s the perfect home now. Pricing a luxury home accurately is key but don’t fall into an agent’s trap of listing at top dollar if that’s not what the market allows for. There’s a saying in the real estate industry about listing a home, “Are you listing the home or selling the home?” The right real estate agent will pull comps for you and do the appropriate research to come to an appropriate figure on the luxury homes value. The house down the street has a pool and this home is the same price, why? Once you’re in the mindset of the buyer you’ll be able to more easily gauge what’s important to them in your specific neighborhood. If your luxury home doesn’t have granite countertops and everything else in the neighborhood does then you need to plan on upgrading your home to neighborhood standards or reduce your price. If you’re thinking about upgrading you may want to consider additional research on upgrades that get the most return on your investment before moving forward. You might be surprised on what upgrades you can do to make you’re luxury home more appealing to buyers and therefore more valuable. 10 Luxury Home Selling Tips To Sell Your Home Fast! Selling a Luxury Home is difficult and if you’re attempting to do it on your own you might just be wasting your time and possibly money. When you have a toothache do you go into the garage and look for pliers to DIY, no you hire a professional. Why then would you consider trying to sell a luxury home yourself? With the internet being the first go-to for people searching for homes, it’s important to have your best foot forward. The way to do this is to have some great photos on your property. Photos of your home, good or bad will be the buyer’s first impression of your luxury home for sale so it’s important to make sure those photos are of professional quality. Many times, agents will pay for this expense knowing how important it is. One good thing to do when listing a luxury home for sale is to have a home inspection done. Doing this upfront allows you the seller to see exactly what condition your home is in. Additionally the buyers will most likely want a home inspection done as well and you can provide this information to them showing them items you’ve possibly already fixed from the report. Imagine a buyers delight when they see a home inspection report with a couple of items that need repair and the sellers have already fixed the items. This shows a buyer that the seller cares for the home and it’s in good condition. While open houses for traditional homes on the market are a good practice, it’s maybe not the best idea for a luxury home. Many people not just buyers will take advantage to view an open house when there’s nothing to do and a luxury home is no different, in fact it will attract even more. Great exposure is what a seller wants to sell their luxury home but this might not be the exposure you want. Savvy sellers will know that an open house at their luxury home is unneeded traffic of curious looky-loos. Not all agents are luxury home real estate agents, in fact it’s a specific niche market that many agents try to delve into but not many succeed. Why do I tell you this, it’s because the importance of selecting and hiring an actual luxury home Realtor will be the difference between failure and success. Luxury home agents have the experience and finances needed to build, plan and execute the necessary adverting needed to sell your home. Location does matter and when buyers are looking for a luxury home they’re also looking for a luxury neighborhood. There are several luxury neighborhoods in Bakersfield like Seven Oaks, Old Stockdale, Talladega, Silverado, Silver Oaks, Grand Island and Country Club just to name a few. Many of these neighborhoods offer amenities like gated community, security, golf courses and CCR’s. Selling a luxury home is a process itself and when you combine it with the home being empty it’s truly an uphill battle. When staging a luxury home make sure to keep things neutral, there are professional staging companies that know exactly what to do and where to put things to appeal to all luxury home buyers. Staging a home creates the warmth and coziness that an empty home simply cannot offer. Like professional photography, many agents will include staging fees in their marketing plan if the home is vacant. Never attempt to sell a luxury home empty unless you’re going to sell it at a rock bottom investor price. This is probably the toughest tip that a home seller endures. Luxury homes often take longer to sell and luxury homes in Bakersfield is no different. Have patience when selling your home, luxury or not. In addition to your Realtor providing you the proper comparable sales in the neighborhood, they’ll also provide you with the days on market (DOM), this info will help you plan and gauge for whats to come and how long it will take to sell. Use the above luxury home selling tips to sell your home and contact us anytime if you have any questions on selling your luxury home in Bakersfield. Implementing the above 10 Luxury Home Selling Tips will help get you started on the right track. As previously stated it’s not an easy road but hopefully these luxury home selling tips will get you going in the right direction.